This star-studded Western featured the graceful lines of Great Western Railway #75, a Baldwin-built 2-8-0, previously seen in my review of Breakhart Pass 1976. GWR #75 has a dual role, also appearing as N de M engine #903 in the movie. 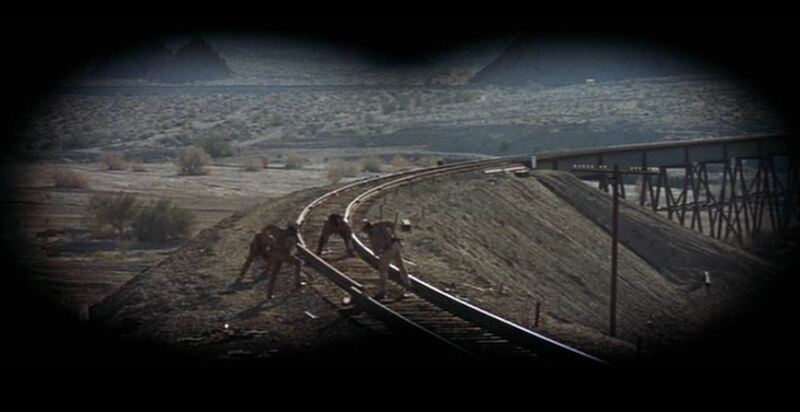 All railroad scenes were filmed east of Indio, California along the iron-ore-hauling Eagle Mountain Railroad. To sum up, a wealthy Texas millionaire, J.W. Grant (played by Ralph Bellamy), hires four men to rescue his wife, kidnapped by a Mexican revolutionary. The four “professionals” eventually track down the head bandito Jesus Raza (Jack Palance) at his hideout, but things are not all as they seem. Come along and enjoy the train scenes with some of Hollywood’s biggest stars of the mid-1960’s. Lee Marvin blasts away from the cab (fireman’s side) of N de M #903. The recoil on that weapon must have been tremendous. Let’s start this review with two views of the same locomotive. First picture is GWR #75 dressed up as “J.W. Grant”. Second picture is as N de M #903. If you’re watching the movie, notice how GWR #75 is always filmed on the engineer’s (right) side of the train, whilst N de M #903 is mostly filmed fireman’s side (left). Coming and going shots of the little train as it rolls along through the desert. Pacing shot with a funky horseless carriage; #75 trundles to a stop. Dig that chartreuse speeder shed! 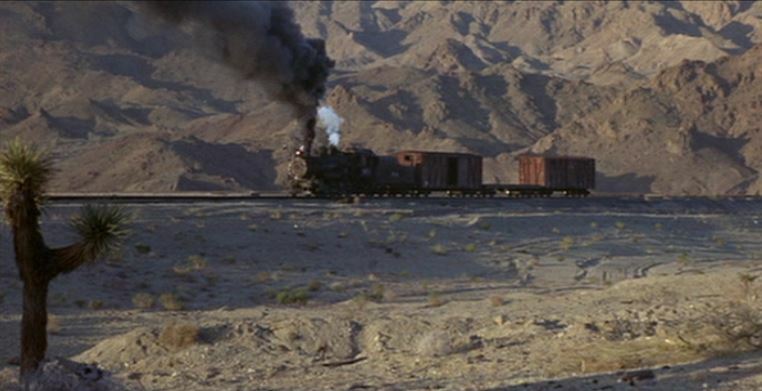 Ralph Bellamy boards caboose 41220 and the train heads towards the US/Mexican border. Inside the caboose, Grant has his finger on his wife’s kidnapper, Raza! (note Lee Marvin right next to Raza in the same newspaper photo). The final stop is the “State Prison Depot” to pick up Burt Lancaster (playing the rummy Bill Dolworth); Robert Ryan as Hans Ehrengard (the horse guy) chats with Grant as he loads their steeds onto the stock car. Marvin leads the union-suit-clad Lancaster to the caboose, while Grant waves an impatient highball; As the train pulls out, note the JWG logo on the side of the caboose. There were similar logos on the locomotive and other locations. At the border, we see Woody Strode as Jake Sharp their bow & arrow guy practicing his craft. The next train scene finds the four pros ( Burt, Robert, Lee, Woody ) in Mexico watching N de M #903 leading its consist. Ahead, some of Raza’s gang are trifling with the trackwork. It’s an ambush! Despite having the banditos completely outgunned, the government troops are quickly overrun with some fancy shooting and horse-leaping stunts. We get our first good look at the leader of the revolutionaries, Jack Palance. Raza notes with smug satisfaction HIS reward poster tacked on the boxcar is for MORE than either Mario or Carlos ($250,000 pesos, whoa!). The gang soon repairs the track, commandeers the train and rides off to their secret hideout (an old mining camp). The train is abandoned and left guarded by one, inept goat herder. The four pros follow and use the train as their staging area. Not only did they bring along plenty of dynamite sticks, the inside of one of the boxcars makes an excellent blackboard for plotting their assault on the camp. Another view of the short consist and closeup of #903 simmering nearby. Robert Ryan shoveling coal into the firebox — which makes an excellent forge for repairing a horseshoe! Still more plot left off here (including a spectacular pyrotechnic display as they assault the mining camp). During the attack, Burt Lancaster has rescued Mrs. Maria Grant (played by Claudia Cardinale, rawr-RAWR! ), and the boys make their escape by rail — a mine cart railway to be exact — which is conveniently downhill all the way back to their train. Lee, Woody and Burt trundle downhill with their tousled Italian in tow, and at daybreak (it must be a VERY long mine cart railway….) roll to a stop next to #903 belching a fine plume of coal smoke. Uh-oh. Back at the train, Robert Ryan has been captured by some of Raza’s gang, but Burt uses Mrs. Grant as a human shield! (can’t shoot the boss’s mistress). Somehow, someway, they clamber up the gangway of N de M #903 and tie their mostly-uncooperative tomato to the tender. You’d almost think she doesn’t WANT to be rescued…. The four pros set off in reverse, back to the good old US of A, with the banditos in hot pursuit. We are treated to some great vistas of the train rolling through the arid desert. Where was I? Oh, yes. Well, that about finishes up the train scenes in The Professionals. Doing a little research for this movie, I discovered there actually IS a real N de M #903! It is a narrow gauge 2-8-0 built by Baldwin and is on display in Acambaro, Mexico. This entry was posted in Uncategorized and tagged Burt Lancaster, Claudia Cardinale, Columbia Pictures, Eagle Mountain Railroad, Great Western Railway #75, Jack Palance, Lee Marvin, Marie Gomez, Ralph Bellamy, Robert Ryan, The Professionals 1966, Woody Strode. Bookmark the permalink. Finally, cleavage, I was worried there would be none, that would be a total waste of time!